Raising goats is a great option for people who want to start homesteading. Goats will provide you milk and a source of meat based on the type that is purchased. You have the option of buying regular goats to dwarf goats to eat grasses in your pasture. However, there are a few things you need to know about buying goats. Buying goats is typically a straightforward process based on need and preference. If you want to breed your goats, then a registered animal will be needed. This means you need to make sure that you locate breeders who are reputable when you are considering buying goats. Another thing to realize is you should research a goat’s lineage or pedigree. If you have any interest in showing goats at a local fair, then they need to be registered. This means the goats you are considering purchasing will need to have the proper papers. If the breeder cannot provide you with the proper papers, then walk away. Buying goats that do not have the proper paperwork will not be a good idea. A reputable breeder will have all the paperwork in order. There are also various questions to ask a breeder before buying goats to take home. You need to ask the breeder if their herd has been tested for a specific disease. Basic questions about the health of the goats and where they are registered should also be asked. If any breeder cannot provide you with a list of local organizations to register goats, then you may want to consider another source. 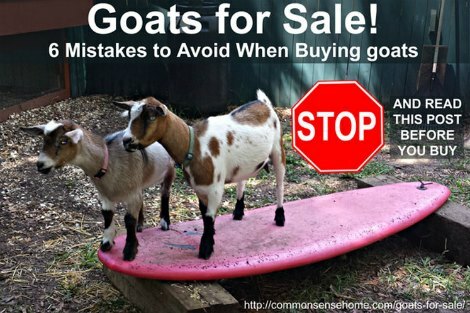 Make sure to know the warning signs when you are serious about buying goats. This includes breeders who are not forthcoming with the necessary information. You should also look out for poor conditions for various goats that are offered for sale and if they appear unhealthy.